Ponies. It's hard for any kid, especially little girls, to resist them, right? 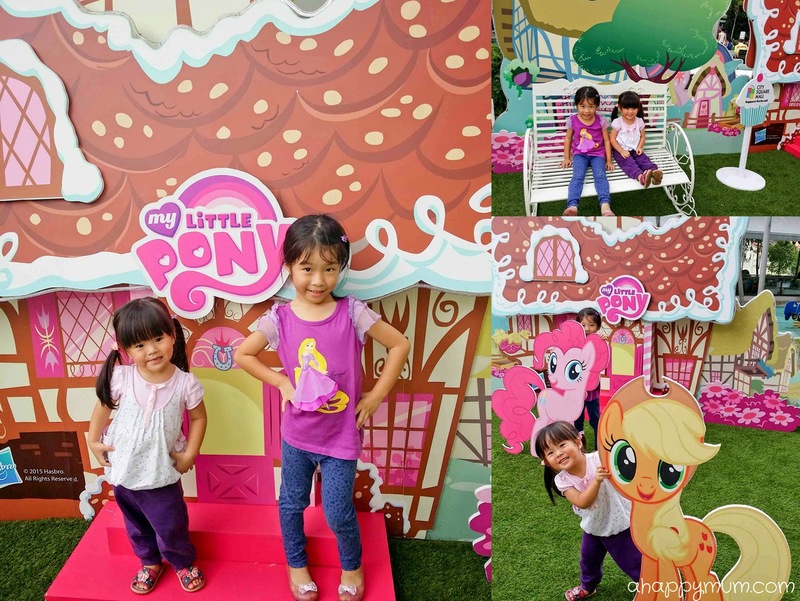 While we are not fervent supporters of the My Little Pony television series and to be honest, I can only name two ponies out of them all, that doesn't mean that my girls will willingly give up a chance to meet these adorable ponies 'live' on stage. So, yes, we went for yet another Meet & Greet session at City Square Mall! Before you decide not to read on and think that it's the same old story, let me tell you what was the deciding factor that made me so resolute to attend this event. We didn't just meet the My Little Ponies 'live' on stage, we also got to come up close with LIVE ponies too! 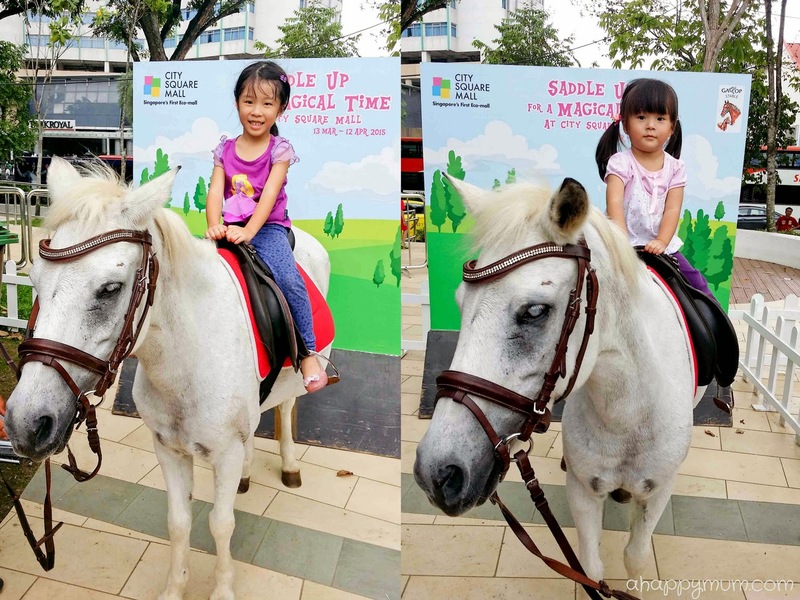 Yes, live, tame and beautiful ponies right outside a bustling shopping mall! Now now, that does sound quite enticing, doesn't it? For me, I realised that while we had let Angel go on half a dozen pony or horse rides in Sweden, this was going to be a first for Ariel. So by hook or by crook, even if the hubby was not around and I had to solely take care of two kids who went fanatical over the ponies, I was going to do it. At first, I was a little hesitant if Ariel was going to be brave enough to do it. Who knows, once she saw the ponies, she exclaimed "Mummy, I want, I want!" and even told me that she wanted to have the pink helmet. Yes, how girly! So, despite it being 1:30 in the afternoon and we had to queue under the hot sun for 45 minutes, that beam on her face told me that it was all worth it. I'm so proud that you actually did it, with no fear and no complaints, my dear! Even though it lasted only two rounds and a couple of minutes, I think you did a great job and sorry to have to disappoint you when you said you wanted to go again! As for the big sister, she was a professional at the riding part and showed even more pluck when it came to the feeding. You know, these ponies might be tame but they still gave some kids a fright and most would not choose to feed them with their bare hands, judging by how their tongues can be ticklish and how they showed off their strong, big teeth. However, Angel was not intimidated in the least and she said confidently "Mummy, I don't need to use the spade, I can use my hands to feed the pony". And so she did, even encouraging the little sister to do so too (who did it once and decided the space felt much safer). 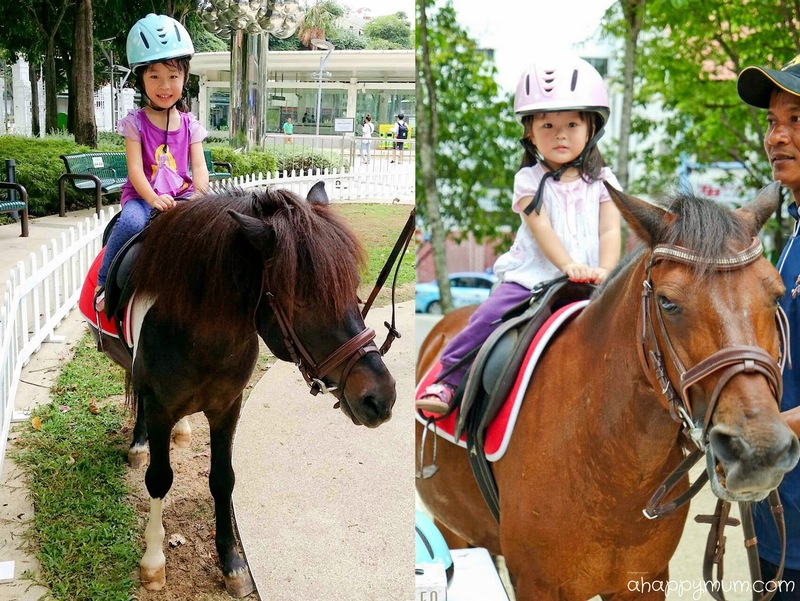 For a package price of $15 per child, he/she can participate in the riding, feeding and also take a photo with the pony to capture the moment, complete with a photo printout and frame. We loved the beautiful white pony at this station and my only regret was that we waited for over 3 hours to get our printouts because there was so much confusion over there. I did feedback to the staff that they needed a system to keep track of whose photo has been printed, let the customers to able to track their photos and give a realistic waiting time instead of telling us to come back every 15 minutes. To give them the benefit of the doubt, we were there on the first day so they said they did not expect such a huge crowd to show up. Hopefully the system has been improved and the waiting time dramatically reduced subsequently! If your child is a fan of My Little Pony and would love to come up close with their favourite characters, then you definitely can't miss this! Come strike a pose, or in my kids' case play peekaboo, at Pinkie Pie’s SugarCube Sweet Shoppe from Ponyville with all the favourite My Little Pony characters. This is located at Level 1 City Green, right outside the main entrance. Of course, if your little one likes to sing and dance, this will be the highlight of them all! 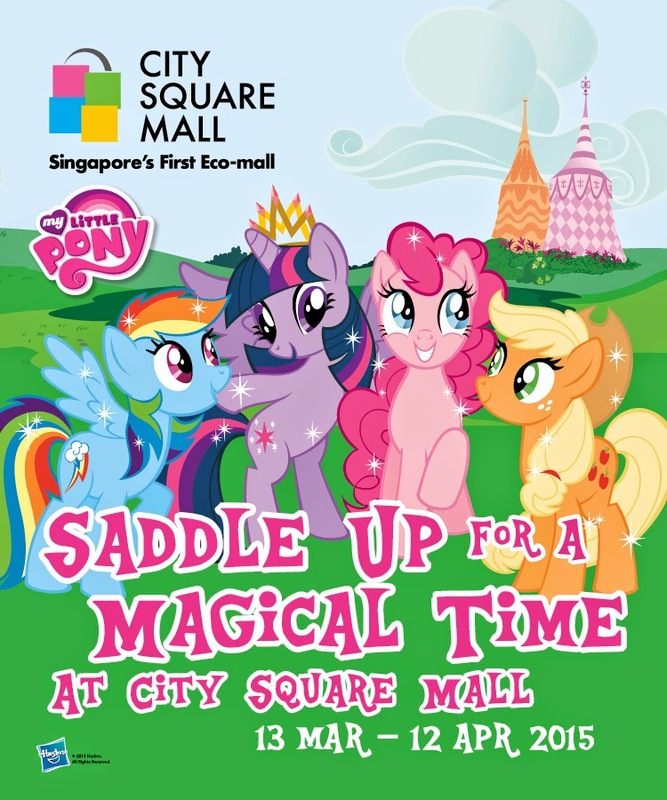 Join Applejack, Pinkie Pie, Rainbow Dash and Twilight Sparkle on their fun-filled pony adventures as they perform for you 'live' on stage. With a minimum spending of $50, shoppers can redeem an exclusive pass for the Meet & Greet session one hour prior to each show at the Level 2 Customer Service Counter. This only takes place while stocks last and don't say I didn't warn you, this show is immensely popular with families with kids! if you wanna secure a good spot, you have to arrive at least 45 minutes before the show begins, that's how well-loved it is! With a minimum spending of $50*, shoppers can redeem an exclusive pass for the Meet & Greet session one hour prior to each show at the Level 2 Customer Service Counter, while stocks last. *A maximum of three same-day combined receipts. 50 passes will be given out one hour prior to each show, strictly on a first-come first-served basis. Receipts used to redeem this Meet & Greet pass cannot be used for any other promotions, except for Free Weekday Parking. Other Terms & Conditions apply. Did my kids enjoy the day's events? Absolutely, positively very very much!!! 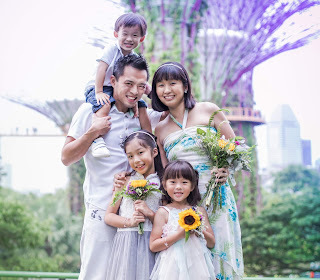 They loved the pony rides, feeding, photo printouts, Zoomoov pony rides (3 rides for $10) and watched the entire live-on-stage performance twice! Plus, they were still reluctant to leave after that! Now, that says a lot, doesn't it? 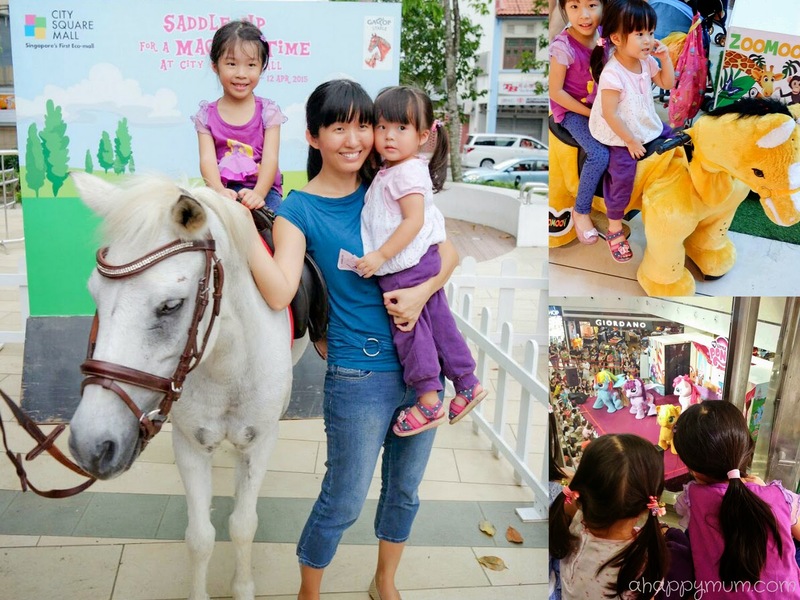 Big thanks to City Square Mall for organising this kids-friendly and fun-filled pony galore that promises a magical time for the little ones! For more information, visit here. 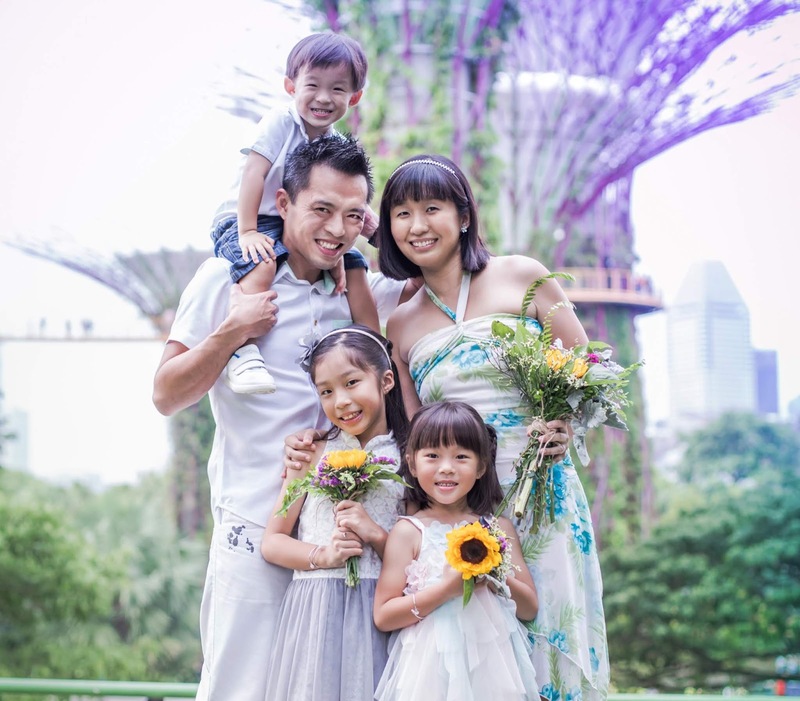 City Square Mall is located at 180 Kitchener Road and is directly linked to Farrer Park MRT station. Disclosure: We were invited to the event and received a complimentary Meet & Greet Pass and a Live Ponies Interaction package. Yes, I paid an additional $15 so that both the girls could enjoy every moment together. All opinions are our own. We didn't managed to make it down on Sarurday but I'm taking Sopie there tomorrow. Thanks for sharing this. Cool!! I hope she will have a blast! Hopefully the weather is kind to you tomorrow too! Weekdays should be less crowded! Have lotsa fun, Susan! I am thinking whether to go this weekend... not Little One's first ride but I reckon she would still love to have it again!